MAN Group will strengthen its activi- ties in the field of large diesel engines. IUAUTY INTERNET WEBSITE: http://www.fernstrum.com sets. Alstom Engines Ltd. employs some 1,500 persons, has an annual business volume of some $201 million, and its business is profitable. For MAN this move represents a diversification in profitable and growing markets for high-speed engines as well as valuable extension of its presence in the market for medium speed engines. Mirrlees Blackstone brands have devel- oped excellent reputations in their respective markets and are complemen- tary to the MAN and MAN B&W brands. The plan is to maintain the acquired business within the MAN fam- ily and to strengthen their technical and brand identities, bringing a wider range of products to a wider range of markets and place more resources at the disposal of customers. For ALSTOM the proposed deal is in line with the decision announced a year ago to divest its non-core industrial businesses, representing about $854 million of sales by April 2000. The announcement of this sale is another step closer to the completion of this divestment process. Engines Ltd. and with key customers will commence immediately. Outboard profile drawing of the new pilot station boats being designed and built by MARCO Ship- yard Seattle. Francisco Bar Pilots. With construction to commence soon, the design portion of the project is near completion. The first vessel is set for delivery before year- end, with the second to follow in early 2001. Company has built a reputation of quality and service, worldwide. 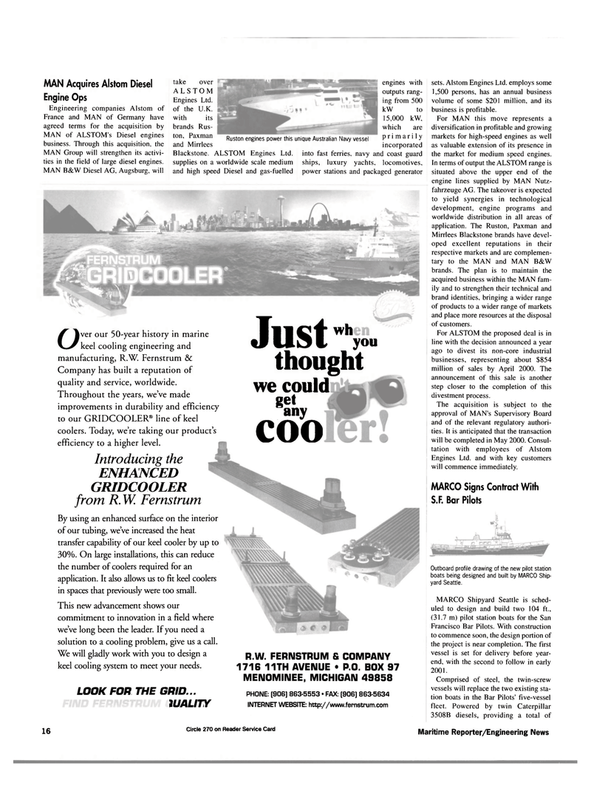 Throughout the years, we've made improvements in durability and efficiency to our GRIDCOOLER® line of keel coolers. Today, we're taking our product's efficiency to a higher level. By using an enhanced surface on the interior of our tubing, we've increased the heat transfer capability of our keel cooler by up to 30%. On large installations, this can reduce the number of coolers required for an application. It also allows us to fit keel coolers in spaces that previously were too small. This new advancement shows our commitment to innovation in a field where we've long been the leader. If you need a solution to a cooling problem, give us a call.